Can World-Class Wine Come from . . . Vermont? Deirdre Heekin ’89 has a compelling case to make. On a warm, late-July afternoon, Deirdre Heekin ’89 was checking her Vergennes vineyard. The four-acre parcel on a former dairy farm boasts a panoramic view of the Adirondack Mountains across Lake Champlain, but Heekin was focused elsewhere. Carefully, she pulled apart long tendrils of leaves and cradled each cluster of fruit with one hand while picking off unhealthy grapes with the other. “We touch every bunch,” she said, no small task in a vineyard that yields about nine tons of grapes each year. Neat piles of pruned branches followed a gentle slope down the line of trellis posts bearing the names of varieties cultivated in each block: marquette, la crescent, brianna, and frontenac. For the last decade, armed with her thoughtfully grown and made La Garagista wines, Heekin has been staging a peacefully persistent—and surprisingly successful—insurgence in defense of these hybrids. “We think about them as regional varieties. It’s about diversity,” she explained. “To me, they’re uniquely American because we’re a melting pot, a big old mish-mash.” Their sturdiness and adaptation to her climate also permits Heekin to farm as she believes best: using organic and biodynamic practices, without synthetic chemicals, and, as she puts it, “working with nature rather than against it,” to produce wines that are distinctively of Vermont. Really, though, wine from Vermont? Made with grapes you’ve never heard of? Heekin and her husband, Caleb Barber ’88, knew what they were up against when they named their tiny winery La Garagista. The French garagiste movement of the late 1970s and early ’80s set out to prove one didn’t need to own a château in Bordeaux to make the finest wine. For a new winemaker in a region with no wine heritage, working with grapes no one took seriously, it was a bold reference. But it turns out to have been prescient. Heekin, La Garagista’s winemaker of record, has since been broadly recognized as a game changer, named one of five “rule-breaking winemakers to know” by Food & Wine magazine, credited with creating a new regional model that could broaden the geography and criteria for world-class wines. Influential New York Times wine critic Eric Asimov was a notable early convert to the La Garagista camp. After he visited the couple’s diversified home farm and winery in Barnard, Vermont, in 2015, he described Heekin’s wines as “so soulful and delicious, they challenge crucial assumptions long taken for granted.” Later that year, he highlighted her 2013 “floral, spicy, lively” Damejeanne, a blend of red marquette with a little white la crescent, among his top dozen bottles of the year. “I never imagined I would fall in love with a Vermont wine,” he acknowledged. The most recent 12 months have delivered a trio of high-profile accolades that have propelled Heekin and her work to a broader stage. She was named a finalist for Wine Enthusiast’s Winemaker of the Year and a semifinalist for the James Beard Foundation’s Outstanding Beverage Professional of 2017. She also earned the title of Imbibe’s Wine Person of the Year. The resilience of hardy hybrids, Heekin believes, can help growers cope with increasingly unpredictable weather patterns and produce wines with the least possible interventions: no synthetic pesticides, herbicides, or fertilizers in the vineyard and no additives or technology-based manipulation in the winemaking cellar. The resulting wines fully deliver the distinctive character of a specific place during a particular season, what the French call terroir. “In a world where homogeneity is becoming more and more the norm, why would we want to make everything taste the same?” she wrote in her 2014 book, An Unlikely Vineyard: The Education of a Farmer and Her Quest for Terroir. It was this book, Heekin’s third, including one coauthored with Barber, that piqued Asimov’s interest. “What was inspiring for me,” he reflected, “was the way she saw wine’s place as part of a complete and diverse farming life.” It reminded him, he said, of the traditional European wine model. “It pays to be a brilliant writer writing about your own wine,” he added with a chuckle. Just as Asimov never imagined he’d fall in love with a Vermont wine, Heekin never imagined she would become a Vermont winemaker. Heekin, originally from Indiana, and Barber, who grew up in southern Vermont, met at Middlebury in the dance program. “It was a little bit of a lightning strike,” acknowledged Heekin with a smile. “I think it took about four days from the day we met.” After they graduated with degrees in English and film (Heekin) and German and philosophy (Barber), an Italian classmate and fellow dancer invited them to come work with her in Italy. The couple married and bought one-way tickets for a yearlong working honeymoon teaching modern dance and English. After building skills in restaurants in both Vermont and Italy, in 1996 the couple opened a small bakery and restaurant in Woodstock called Pane e Salute, which translates to “bread and health.” They grew much of their own produce for the menu of authentic, unfussy Italian dishes like crisp-crusted Tuscan pizza and saffron-scented risotto, earning national acclaim from media including Bon Appétit and Travel & Leisure. At Pane e Salute, Barber cooked and Heekin ran the front of the house. From the outset, she said, she approached wine as they do in Italy: “Wine in Italy was about food: wine is food.” As the restaurant’s wine buyer, she had many opportunities to taste, and, on regular trips back to Italy, the couple sought out vintners to learn from. Heekin’s inaugural winemaking forays—in her clawfoot bathtub with purchased grapes—were to educate herself: “I wanted to taste it at every point in the process, to understand fermentation viscerally.” But Heekin recognized she needed to grow her own fruit to experience the full winemaking arc. In 2007, the couple visited Chris Granstrom ’74, whose Lincoln Peak Vineyard in New Haven, Vermont, was a leader of cold-hardy hybrid grape cultivation in the region. They loaded 100 vines in the back of the car and planted them in a meadow at their Barnard homestead. “Natural” is a wine-world hot button. There is no official definition of “natural wine,” but, as Asimov has explained in the New York Times, most are made “by farmers who practice classic forms of viticulture and winemakers who may try to guide the path of production but don’t seek to control it.” Heekin outlined her four guiding principles: Farming responsibly, always biodynamically or organically; using only native yeasts for fermentation, which means yeasts that are already present on the fruit or in the cellar; adding no or minimal sulphur dioxide, an almost universally used stabilizer and preservative that does exist, in trace amounts, in all wine; using no other chemical interventions or manipulation. "We try to taste a lot during harvest to inspire ourselves," Heekin says. Tasting is critical to understanding wine development. 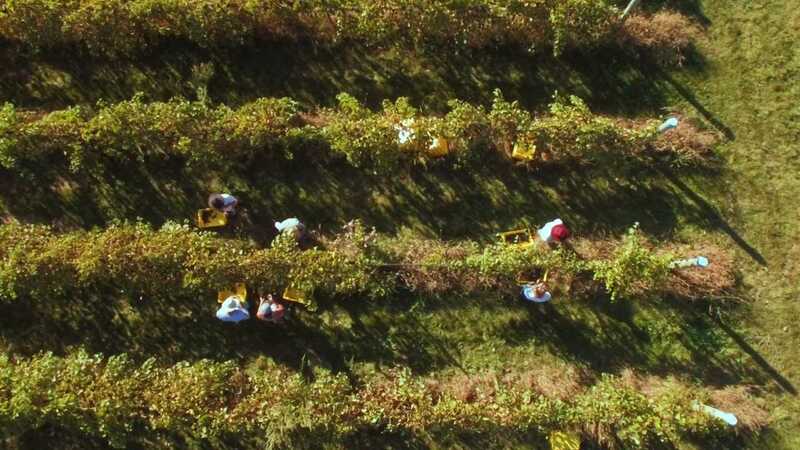 In Vergennes in late July, Heekin’s assistant had just sprayed the vineyard with a solution of kaolin clay, nettle tea, and elemental sulphur, which sparkled softly from the leaves like fairy dust. After a wet and humid week, the biodynamic treatment was intended to help prevent downy and powdery mildew. A conventional grower, Heekin said, would likely spray antifungal chemicals a couple times a season no matter what, and also use herbicides to keep weeds and grass in check. “You sacrifice the health of the soil when you do that,” Heekin said. A fundamental biodynamic tenet is that natural diversity has immense value; allowing a variety of plants and wildlife to thrive provides critical clues and services to both the cultivated crop and to overall landscape health. Heekin pointed out abundant Queen Anne’s lace among the vines. “It is nature’s way of managing compacted clay soils—because the roots are a natural tiller,” she explained. But sometimes, she added, “nature needs a little help,”so she and her crew till between rows to help break up and aerate the earth. Early on a Tuesday last October, about 10 people gathered in Barnard at the home farm and winery to help with winemaking, including the traditional grape-stomping of frontenac gris picked the day before. Prince was playing over the sound system and assistant winemaker Krista Scruggs was extracting deep ruby juice from a batch of crushed grapes. In Barnard, outside among the apple trees, a long table was set with mismatched plates, jelly jars for water next to wine glasses, and vases of cosmos picked from between the vines with dahlias from the flower gardens. Chickens strutted about, free-ranging through the kitchen garden and out back under the plum trees. Barber sliced sunset-hued tomatoes on the balcony that serves as his summer outdoor kitchen. There was local smoked chicken, grilled eggplant, and red potatoes from the gardens, half a wheel of Vermont cheese, and fresh bread. And there was wine, of course, including wine-to-be: just-pressed, very slightly fermented juice of grapes harvested the day before. With theatrical flair, Barber sabered open a bottle of House Music, a pétillant naturel, a softly effervescent blend of six grape varieties fermented together. There were also bottles of Vinu Jancu, made from la crescent fermented on the skins in an open vat in the style of vin jaune from the Jura, and Damejeanne, the Vermont red made with marquette. Each wine spoke in a different way to the vintage, vineyard, and grapes from which it had been crafted. They shimmered with ripples of limestone, alpine strawberries, white currants, and green apples. The assembled crew raised their glasses to the soil and the fruit, to the community gathered around the table, and to the vigneronne who had a vision for what Vermont wine could be. Melissa Pasanen is an award-winning freelance journalist specializing in articles on food and agriculture for a variety of regional and national media. She lives in Vermont and is a regular contributor to Seven Days newspaper and Vermont Public Radio’s weekly food series.